Unassuming photographer Jane Bown built up a formidable body of portraits in her almost 60 years spent working at the Observer. Looking for Light: Jane Bown is a new documentary by Luke Dodd and Michael Whyte which showcases some of Bown’s best known images and explores her unique technique and her personal influences. The film captures Bown’s quiet tenacity and her unusual perspective that led to her success in an industry more comfortable with women appearing in front of the lens. Bown does not fit the old stereotype of a flamboyant photographer. A quiet Home Counties type, she carried her photographic equipment around in a picnic basket (favouring the same type of camera, an Olympus OM-1, for decades). She eschewed fancy gadgets, reusing particular settings to capture her images instead and gauged the light by looking at how it fell on the back of her hand. One former colleague comments that Bown was “good at being a nobody”. Yet her black and white portraits of the famous and infamous, such as Samuel Beckett, Jayne Mansfield and Paul McCartney, have become iconic, even if the creator herself remains a shadowy figure. This new documentary grew out of an interview the shy Bown gave in 2005 as her time at The Observer was ending and is augmented by more recent interview footage. It tracks Bown’s unsettled childhood, her decision at the end of the Second World War to enrol in a photography course at the Guildford School of Art, her solid technique which led to the job at the Observer and an early assignment photographing a generous Jean Cocteau and his cat in Paris. There is a clear contrast between the interviews filmed in 2005 and more recently. The later footage shows Bown in a more reflective and personally revelatory state, frankly discussing her fractured upbringing. Bown never knew her father, was brought up in Dorset by a series of aunts, and held anger towards her mother, anger that remained unresolved at the time of her mother’s early death. The documentary shows Bown now in her home, with her cat, rummaging through old boxes and looking around family graves in the churchyard with her son. There is no high-art, loft-style living here – the ordinariness of Bown’s decor (a plethora of framed family photographs on the mantelpiece, chintz armchairs) belies the stylish monochrome images upon which she built her formidable reputation. From another view, Bown’s modest, suburban home directly echoes the naturalistic, non-stylised approach she took to portrait photography: using available light, shooting with a shallow depth of field near a window, preferring uncluttered backgrounds to elaborate sets or studios. It becomes clear that Bown made the Observer her home and surrogate family – to the point that her editor even walked her down the aisle. A touching moment in the film occurs with images of the photographer visiting the flash new offices of the newspaper and stationing herself in her wheelchair in the lobby, so she can catch up with former colleagues once a week. This degree of belonging and loyalty seems to exist in a vanished world. The documentary – like Bown herself – is sparse and unassuming. Director Luke Dodd has the benefit of a full overview of Bown’s work. He worked as her archivist, transferring her entire life’s work to the repository established to preserve the histories of the Guardian and Observer newspapers. Dodd has commented in the past that there is something radical about the non-intrusiveness of Bown’s working method and her deep respect for her subject matter, and this is evident in the images selected to form part of the film. 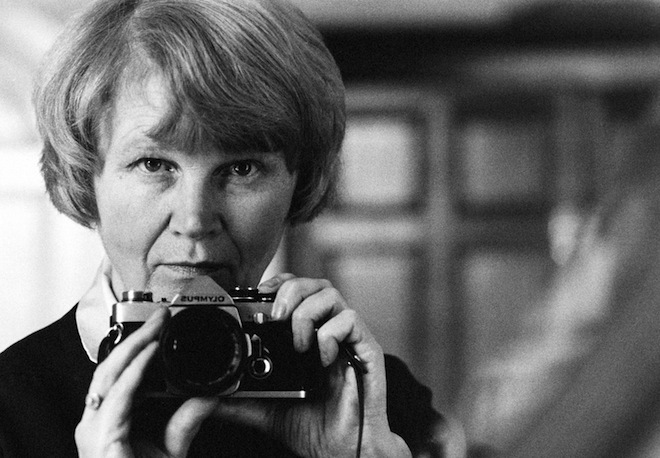 The strength of Bown’s photography is allowed to shine through; photos are presented as a slideshow without narration, at various points throughout the film, giving insight into her talent. The soundtrack is noticeable by its absence. The film also draws on commentary from Bown’s former colleagues, friends, family and subjects to present a rounded image of this professional. Directors Dodd and Whyte have chosen their contributors well, with each fleshing out a different period or aspect of Bown’s work and life. Richard Ashcroft, rocker and former frontman for the Verve, is an unexpected devotee. An unlikely pairing, Ashcroft speaks reverentially of Bown’s mastery of her craft. The film consistently looks beyond the appearance of its central subject and seeks to illuminate just how she manages to capture revealing images of big names. It suggests that Bown’s attributes perhaps led some subjects to underestimate her. “Being a nobody” became her strength as subjects dropped their guard in the presence of an apparently unthreatening soul. But this wasn’t her only attribute. Bown could hold her ground, elbows out, at the front of press packs, but likewise she could anticipate and capture a moment that others wouldn’t think of, such as a shadow falling across the face of Anthony Blunt or a notorious suspect making a back exit from the Old Bailey. Any career that starts with a photograph of Bertrand Russell and ends photographing Queen Elizabeth II on her 80th birthday is an undeniable triumph. Jane Bown: Looking for Light will be of particular interest to photographers and Observer readers. Whether you are familiar with Bown’s back catalogue or not, the recognisable faces featured in the film and exploration of the dynamic process of capturing their portraits make for a compelling viewing not just for photographers and Observer-aficionados. Looking for Light: Jane Bown is released on 25 April by Soda Pictures. The picture is self-portrait taken in mirror, circa 1986, by Jane Bown.